Published on January 9, 2012 by Wade Shepard Follow me on Twitter here. Border crossing can be a stressful part of traveling, this page is to provide information about crossing the Senegal border. Did you ever cross a land border into this country? If so, submit a record of your experience of crossing the border into Senegal below. What does a traveler need to go to Senegal? What documents? What visas? Can you get a visa at the border? Do you need to have a visa in advance? What transportation options does a traveler have after crossing the border into Senegal? What is the best way to get to this border? How can you get away from it? Hi. I am travelling overland in Africa with a small motorcycle. The worst border I have ever encountered has to be the border at Rosso – Mauritania/Senegal – I had read about the hassles of this border and was prepared, but not prepared enough! On arrival at Rosso I was accosted by dozens of peopkle wanting to assist me in the crossing formalities. I ignored the hassles and finally made it inside the gated area. Here I was approached by a person claiming to be Senegalese and working for one of the many small boats crossing the river. He offered his help in getting us through the formalities for free. I hesitantly accepted his offer. He got all the paperwork done and it would seem that I got that at the official price so no problems there. My bike was then manhandled onto one of the small passenger boats and I was on my way across the Senegal River and into Senegal. On arrival in Senegal he again offered to get all the formalities completed. This is where the problems started! The police/Immigration went smoothly enough. Then it was onto the customs. Here came the problems. I was asked to pay for insurance for Senegal. Since I had international insurance that included Senegal I explained this to the customs. He just shrugged at this and stated “Senegal Insurance, you pay now”! So I argued the point of insurance with him for about 1 hour. Finally he gave up on this. Next he demanded a Tax of 30 Euro to enter with the Motorcycle. Then he demanded another Tax of some description. Then a fee for permission to enter Senegal with a vehicle! The end result was paying nearly 100 Euro to enter Senegal. All unofficial of course! Also all of this took nearly 4 hours to complete. During this 4 hours I was continually hassled for money or payment of some kind or another to which I refused. 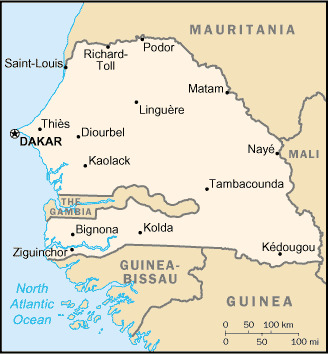 Submit information about crossing into Senegal below. Previous post: How Much Money to Travel in New Zealand?